I think I have officially deemed this week Bailey’s week in honor of the upcoming St. Patrick’s Day. Now I have never been one to partake is any crazy St. Patty’s Day festivities, expect that last year I ate a green bagel and I was feeling pretty adventurous. 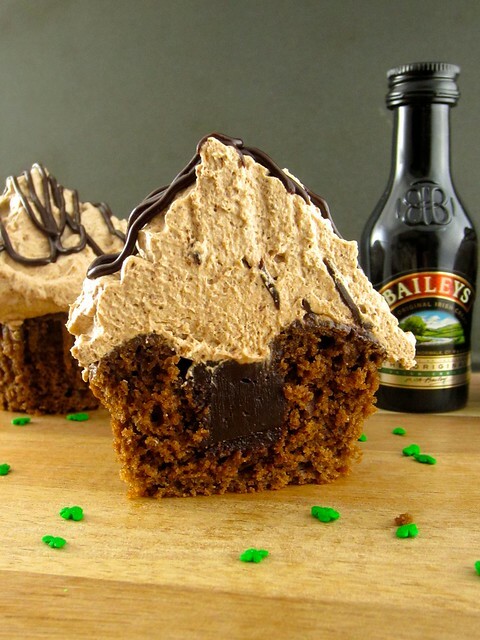 However, I love the subtle flavor of Bailey’s Irish Cream. 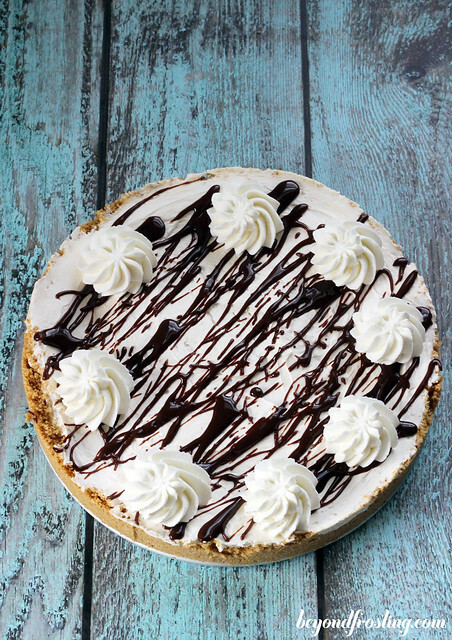 If I had to describe this Bailey’s Spike Ice Cream Cake in one word, it would be “silky”. 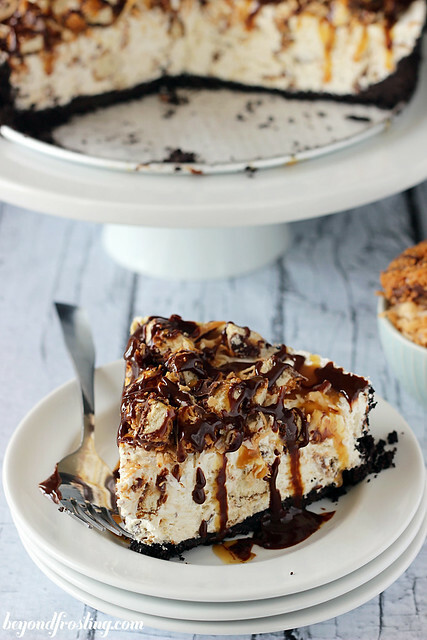 I was amazed at the smoothness, creamy, silky texture of this pie. It is really quick simple to make. 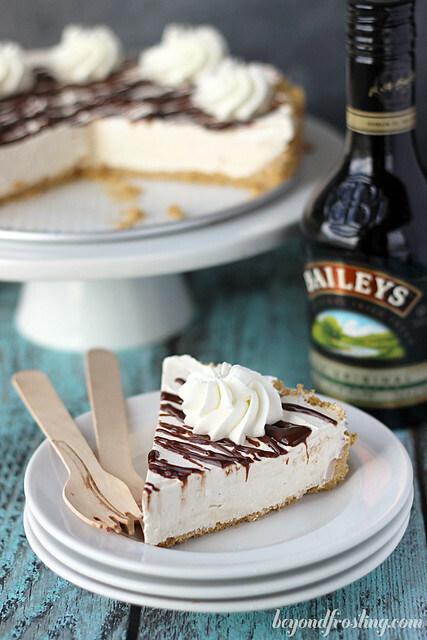 All you need is a block of cream cheese, some sugar, Bailey’s Irish liquor and cool whip. The filling comes together in less than 10 minutes and only takes a couple hours to freeze. I like it best before it’s completely frozen. I do suggest removing it from the freezer at least 15-20 minutes before serving to allow it to soften up a little bit. I debated a lot on the crust to use: Oreo or Graham Cracker. Obviously I decided on graham cracker. I initially wanted to incorporate some coffee flavor, and tried a mocha whipped cream. I tasted it and immediately threw it out; It was entirely too strong. I should have made a batch of Lindsey’s Bailey’s Whipped Cream, but instead settled on plain homemade whipped cream. 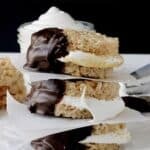 You don’t need a lot for this recipe if you are just piping the edges, However, I piled my whipped cream pretty high on my slice. The homemade whipped cream also freezers nicely. 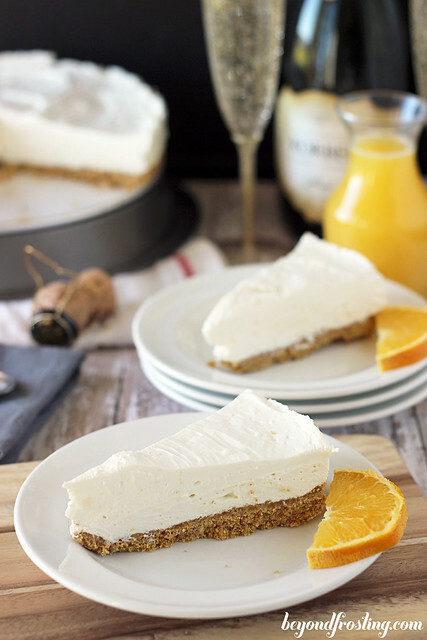 Truth be told, I can’t get enough of the no-bake cakes/pies lately. 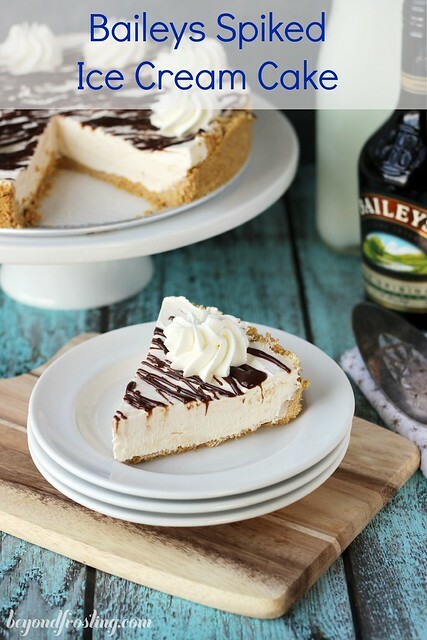 My obsession started in January with the no-bake White Chocolate Mimosa Cheesecake, then the Spiked Chocolate Mousse Parfaits, Samoa Cookie Ice Cream Cake and finally this Bailey’s Spike Ice Cream Cake. 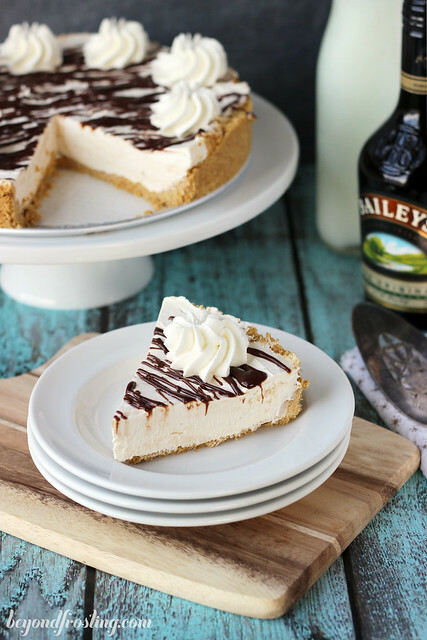 Spoiler alert, I have a Bailey’s cheesecake something or rather coming up on Thursday! Quick no-bake desserts are essential tools to have in your back pocket. Now I used a spring form pan for this ice cream cake, but a pie plate will work just fine. I love the look of the cake when you remove the edge of the pan and the graham cracker is perfectly (or in some cases not) stacked along the edge. 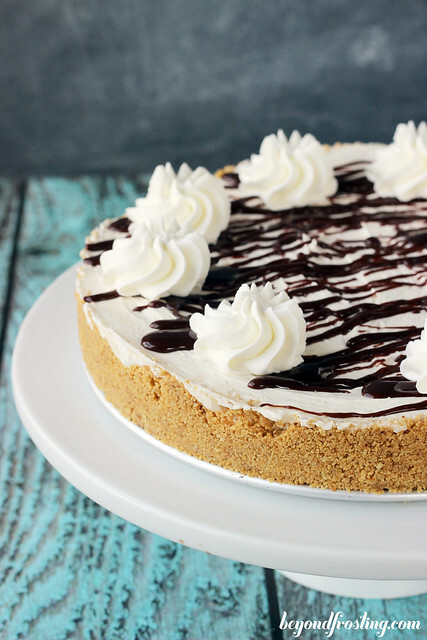 I drizzled this ice cream cake with a Bailey’s Spiked Chocolate sauce. The same sauce that I used in my Bailey’s French Toast on Sunday. Make sure to check that one out too. 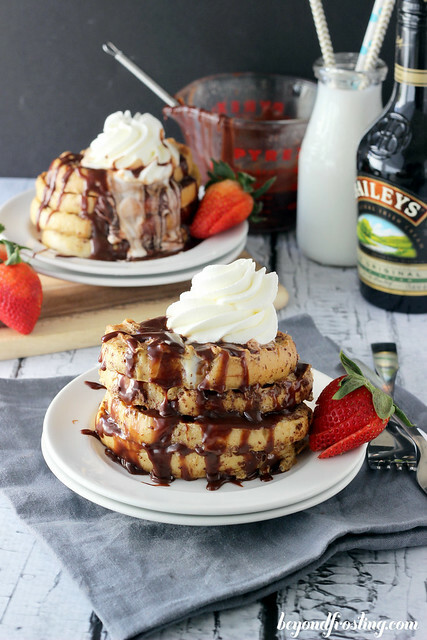 If you are alcohol-free, don’t fear, just substitute Irish Cream coffee creamer wherever this recipe calls for Bailey’s. The flavor in the ice cream is somewhat strong, so you can nix the irish cream in the ganache if you want. If using whole graham crackers, use a food processor to grind into a fine crumb. Melt butter in a microwave-safe bowl and pour melted butter over graham crackers. Stir to combine until all crumbs are moistened. Line the bottom of a 9” spring form pan with parchment paper. Pour graham cracker crumbs and spread evenly with your fingers. Press graham crackers against the sides of the pan to form the crust. Set aside. In a mixing bowl, beat cream cheese for 3-5 minutes until smooth. Add sugar and continuing mixing 2-3 minutes until sugar is dissolved in cream cheese. Add Bailey’s Irish Cream and mix until well incorporated into cream cheese. Fold in Cool Whip and mix until thoroughly incorporated. 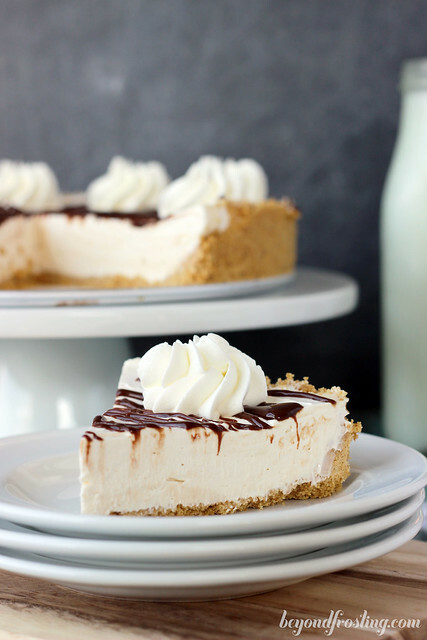 Pour batter into the graham cracker crust and spread evenly. Freeze for at least 2-4 hours. Prepare the whipped cream before serving (can also be added when the cake is done and frozen as well). Put your mixing bowl and whisk in the freezer for 10 minutes to get them nice and cold. This step is not necessary, but is recommended. Using the wire whisk attachment, beat 1 cup of heavy whipped cream on medium-high heat for 2 minutes until cream becomes bubbly. Add powdered sugar while mixer is still going. Increase speed to high and beat until stiff peaks form (another 3-5 minutes). Pipe whipped cream on ice cream cake. After completely frozen, remove ice cream cake from freezer at least 15 minutes before serving to soften. What can I substitute for cool whip. No cool whip available where I live. Hi Reepa, I am sorry I don’t have a suggestion for you. I have never made it without it. I do know that you can stabilized whipped crew, if you can get gelatin.